Here are a few tips from SSE's gardening crew on how to grow potatoes for a healthy and bountiful harvest. Potatoes always do best in full sun. They are aggressively rooting plants, and we find that they will produce the best crop when planted in a light, loose, well-drained soil. Potatoes prefer a slightly acid soil with a PH of 5.0 to 7.0. Fortunately potatoes are very adaptable and will almost always produce a respectable crop, even when the soil conditions and growing seasons are less than perfect. Always keep your potato patch weed-free for best results. Potatoes should be rotated in the garden, never being grown in the same spot until there has been a 3-4 year absence of potatoes. Potatoes may be planted as soon as the ground can be worked in the early spring, but keep soil temperatures in mind. Potato plants will not begin to grow until the soil temperature has reached 45 degrees F. The soil should be moist, but not water-logged. Potatoes can tolerate a light frost, but you should provide some frost protection for the plants if you know that a hard, late season freeze is coming. If you want to extend storage times, and have a long growing season, you can plant a second crop as late as June 15 and harvest the potatoes as late as possible. We find that potatoes are best grown in rows. To begin with, dig a trench that is 6-8 inches deep. Plant each piece of potato (cut side down, with the eyes pointing up) every 12-15 inches, with the rows spaced 3 feet apart. If your space is limited or if you would like to grow only baby potatoes, you can decrease the spacing between plants. To begin with only fill the trench in with 4 inches of soil. Let the plants start to grow and then continue to fill in the trench and even mound the soil around the plants as they continue to grow. Prior to planting, always make sure to cultivate the soil one last time. This will remove any weeds and will loosen the soil and allow the plants to become established more quickly. 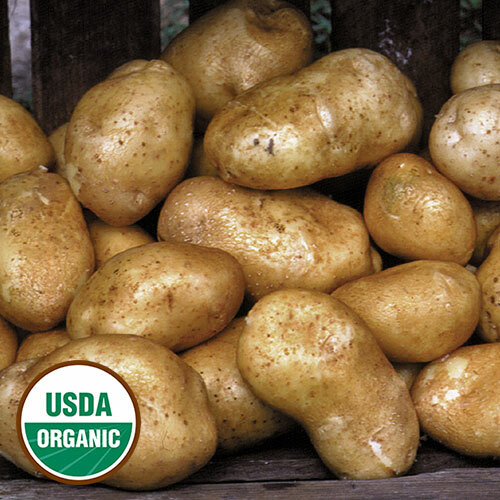 Baby potatoes typically can be harvested 2-3 weeks after the plants have finished flowering. 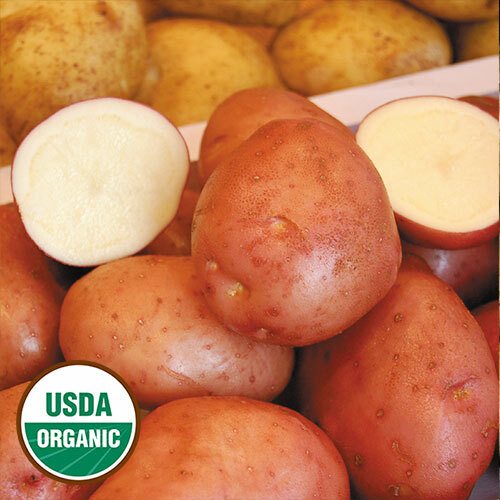 Gently dig around the plants to remove potatoes for fresh eating, being careful not to be too intrusive. Try to remove the biggest new potatoes and leave the smaller ones in place so they can continue to grow. Only take what you need for immediate eating. 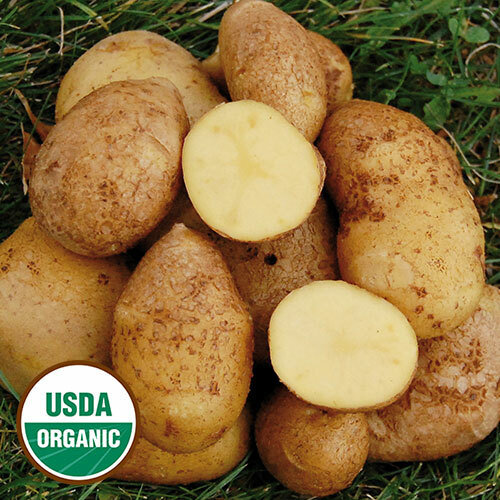 Homegrown new potatoes are a luxury and should be used the same day that they are dug. Potatoes that are going to be kept for storage should not be dug until 2-3 weeks after the foliage dies back. Carefully dig potatoes with a sturdy fork and if the weather is dry, allow the potatoes to lay in the field, unwashed, for 2-3 days. This curing step allows the skins to mature and is essential for good storage. If the weather during harvest is wet and rainy, allow the potatoes to cure in a dry protected area like a garage or covered porch. At Seed Savers Exchange. we are able to store potatoes well into the spring in our underground root cellar. Try to find a storage area that is well ventilated, dark, and cool. The ideal temperature is between 35 and 40 degrees F. Keep in mind that some varieties are better keepers than others. Varieties like Red Gold and Rose Gold are best used in the fall, and others like Carola and Russets are exceptional keepers. In collaboration with University of Wisconsin-Madison researchers, SSE is working to eradicate viruses from heritage potatoes in order to safely preserve potato genetic diversity and to offer high quality seed potatoes.